A proscenium house, which seats 550 people, is the School’s largest venue. For all performances, enter campus at the McClintock Avenue Entrance at the corner of McClintock and Jefferson Boulevard. Please inform the gate attendant you are attending a School of Dramatic Arts event to receive a reduced rate of $10 (except on USC Event Days). For questions about shows, events or programs, call School of Dramatic at 213-740-8686. 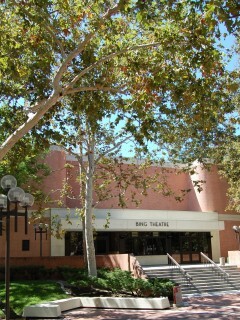 To reserve or rent a theatre, email Brian Bowen at bjbowen@usc.edu.